An unexpected journey – a trampers tale. River crossing early this morning. 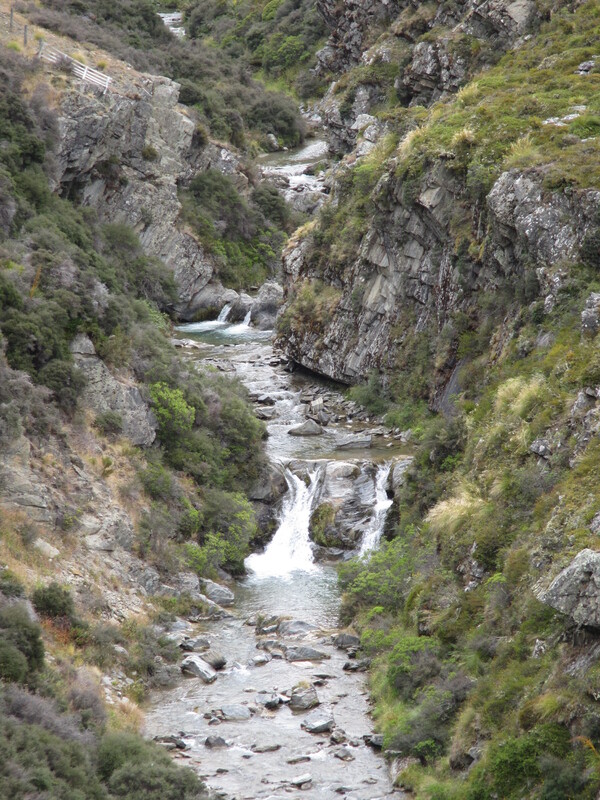 Just one kilometre from my camp site in the pines there a steep descent down to the Ahuriri River. Being so early in the day I wasnt about to get my shoes and socks wet and took them off. It looked a little deep as well. The water was clear and I could see the bottom and saw there were a couple of deeper holes. To be on the safe side I stripped off my shorts as well. Sure enough the deepest pockets were just under undies height. The current was strong but easily negotiable with no hassles. The water was freezing first thing in the morning. Across the other side it didn’t take long to dry off with the wind. What goes down must go up. Approaching the steep bank on the far side that would take me up to the terraced paddocks up above I’m sure I was looking at a trail joke. The marker poles indicated to go straight up the near vertical gravel bank, when just a short distance to the side with a gully and much easier ground and a 100m further to the right a gravelled track leading up the hill. What the heck, I followed the poles. Impossible to head straight up on the slippery gravel, it was necessary to step up on rabbit tracks and slowly switch back my way up. Once into the paddocks it was a quick walk to the Birchwood Road and the start of the next section, exiting Canterbury and entering into a new district for a long while, Otago. From here the journey was quite unexpected. I had not paid too much attention to the route on my maps today and had it in my head that Te Araroa enters back into forest. To my surprise that trail followed a well graded farm road and dozer trails for just about the whole day. The walking was easy, following the undulating track along the Avon Burn. It was a big station that the trail led through but I didn’t see a lot of stock. What did stand out though were some black sheep with their tails intact. Seeing sheep with docked tails just about anywhere you go in the world that becomes the normal image that you have of sheep and you forget that they are born naturally with tails. They were funny to watch running up and down the hills, tails bouncing. The river was nice. Lots of small cascades through rocky gorges along the way. 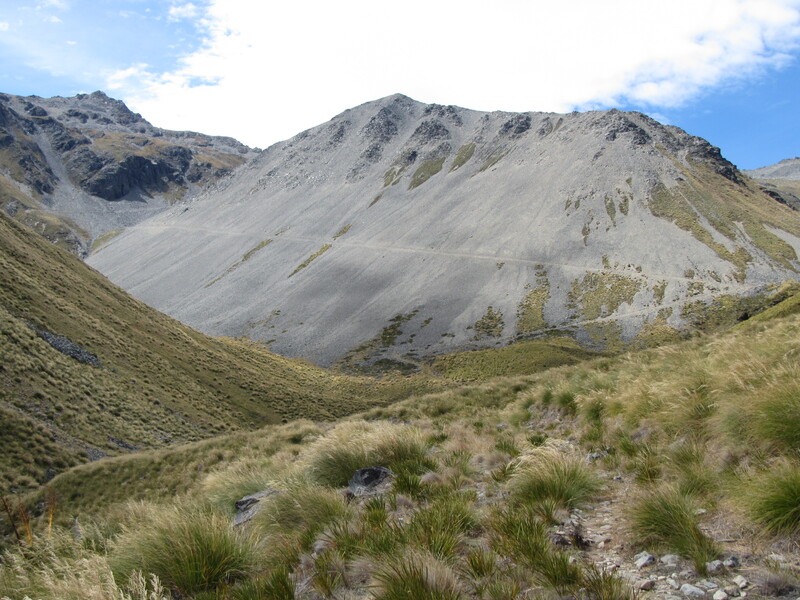 Around 9km in from the Birchwood Road through the farm Te Araroa passes an old hut. I think it is a private hut but the toilet had a DOC asset tag attached to it. Anyway it was open, not locked like most private huts and I popped in for lunch. Just as I was about to leave a hunter heading down from the hills swung by the hut for lunch as well. 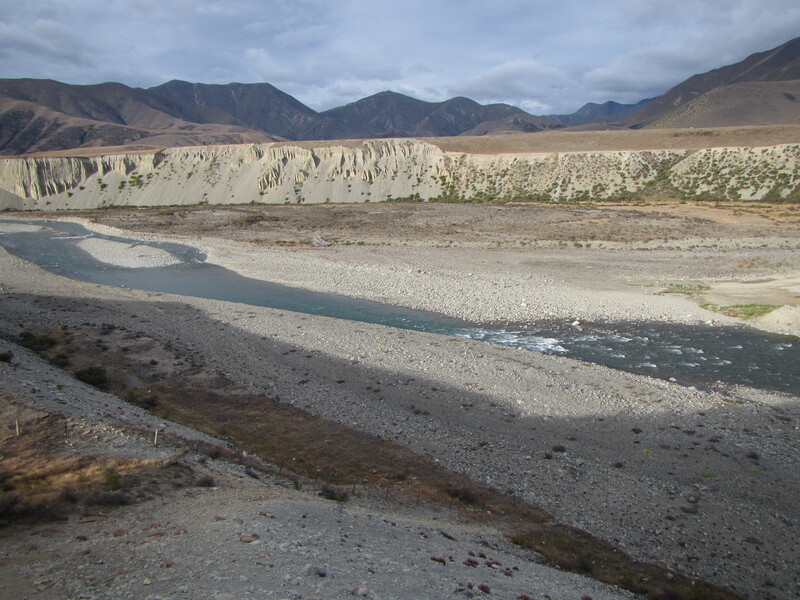 We had a great old chat, him having completed the south island portion of Te Araroa last year. He hadn’t had much luck chasing game up high with winds picking up. He was able to provide a great description of what lay ahead for the day. Leaving the hut, there was an easy crossing over a river, leaving the station and getting back onto Conservation estate. From here the trail followed a bulldozed trail through some amazingly steep and rocky country. How they got a machine to construct a track through some of this rock is any ones idea. It was well graded. Obviously those that put it in know a little about roading. This continued for just about the whole next 11 km, right up and over a saddle and into another valley, the track deeply sidecut and switched back to get up and over. Crazy, madman dozer operators. Up on top of the saddle the wind was horrific. Extremely strong and blustering, it didn’t know what it wanted to do, hitting me in the face, then swinging 180 and shoving me in the back. A couple of times I could hear the biggest gusts coming towards me as the wind whistled up the valley through the rocks. These biggest gusts strong enough to knock me sideways. I swear one gust caught my pack like a sail and fully lifted me off the ground and forward a metre. I had to really take my time to keep my footing and not get pushed over the steep side. Working my way down the dozer trail the wind continued but did drop off a little. 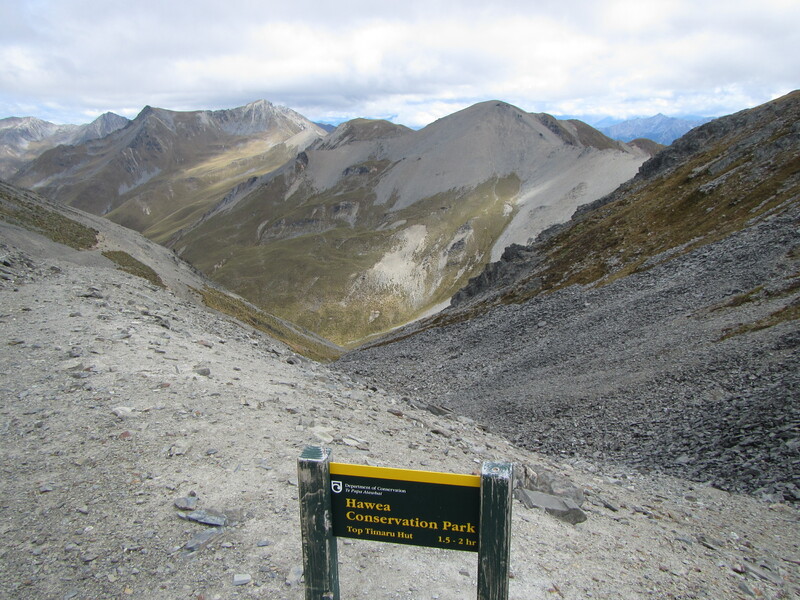 Once on the valley floor it was only a matter of following the easier trail for a few more kilometres following the Timaru River, to the Top Timaru Hut, the nice dozer trail petering out into more of tramping standard trail. Dozer track side cut in scree from the pass. It wasn’t a long day today and I reached the hut around 4pm, meeting up with Carl and Venessa ‘Nessa’, from Germany. I first met Carl a few weeks ago near the Harper Pass. Nessa and Carl have just teamed up over the last few days. Shortly later a kiwi NOBO arrived named Amber; and an Aussie NOBO, Harry. Great conversation, tea, coffee and chocolate to while a way the afternoon.